To promote the hobby of water gardening, and the keeping of ornamental fish, to disseminate information about the above to the membership; to engage in the educational and social activities related to our purposes; and to acquire and own such property as may be necessary for any or all of the foregoing purposes. If you are interested in joining the Inland Empire Water Garden & Koi Society, click on "App" below and fill out the application. We welcome all members. With summer heading our way, many of us will be spending a lot more time sitting outside admiring our fish and our pond. Why not share that time with other society members and guests while enjoying a root beer float! Contact floats at iewgks.org to schedule your Floats on the Pond. 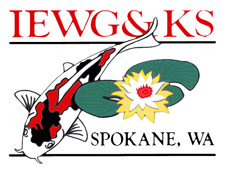 Join our online community to get the latest water garden and koi club news. Presentation: Opening Your Pond by Diana Lynn Rehn. If you wish, please bring a snack to share and your own beverage. RSVP: 509 924- 7672 or lindalifeisgood@gmail.com if you are planning to attend. We are available on Facebook if you have questions or concerns.